The Hiroshima Toyo Carp (広島東洋カープ, Hiroshima Tōyō Kāpu) is a Japanese professional baseball team in the city of Hiroshima and Hiroshima Prefecture. 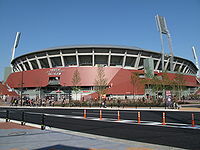 The Carp play in Japan's Central League or Ce League (セリーグ, Se reegu). The team's ballpark is Mazda Stadium. The Carp is a team with the greatest number of perfect games Japanese professional baseball. The team joined the Central League as the Hiroshima Carp in 1949. Carp Won Central League Championship for the first time in 1975. The team mascot "Slyly" bears resemblance to the Phillie Phanatic of the Philadelphia Phillies. "Carp Boya" is another team mascot. ↑ 1.0 1.1 Hiroshima. Wikivoyage. ↑ Nippon Professional Baseball (NPB), "Teams (Rosters, Schedules/Scores, Individual Stats); retrieved 2012-7-17. ↑ Bjarkman, Peter C. (2005). Diamonds Around The Globe: The Encyclopedia Of International Baseball, p. 151. ↑ BaseballReference.com, Koji Yamamoto; retrieved 2012-7-17. ↑ BaseballReference.com, Sachio Kinugasa; retrieved 2012-7-17. ↑ BaseballReference.com, Kenjiro Nomura; retrieved 2012-7-17. ↑ BaseballReference.com, Tomonori Maeda; retrieved 2012-7-17. ↑ BaseballReference.com, Akihiro Higashide; retrieved 2012-7-17. ↑ BaseballReference.com, Kenta Kuirhara; retrieved 2012-7-17. ↑ BaseballReference.com, Eishin Soyogi; retrieved 2012-7-18. ↑ BaseballReference.com, Kenta Maeda; retrieved 2012-7-18. ↑ BaseballReference.com, Takuro Ishii; retrieved 2012-7-18. ↑ BaseballReference.com, Shogo Kimura; retrieved 2012-7-18. ↑ BaseballReference.com, Hiroki Kuroda; retrieved 2012-7-18. ↑ BaseballReference.com, Alfonso Soriano; retrieved 2012-7-18. ↑ BaseballReference.com, Ken Takahashi; retrieved 2012-7-18. This page was last changed on 1 April 2018, at 21:20.